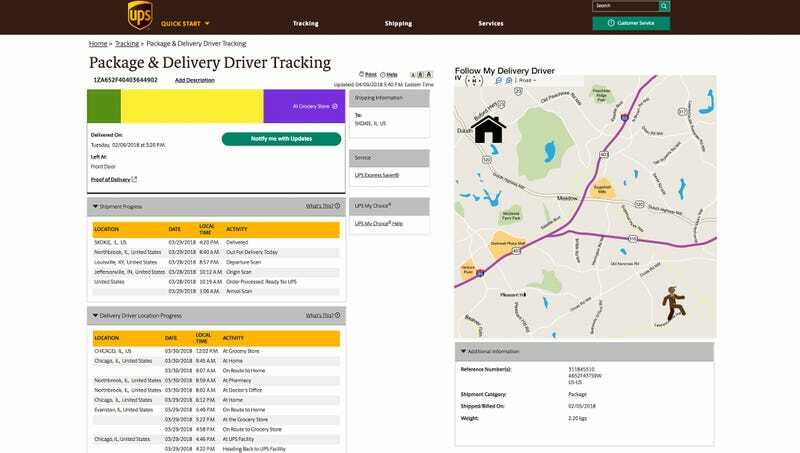 ATLANTA—Claiming that their new Extended Tracking™ feature would provide customers with additional security and peace of mind, UPS introduced new ordering metrics Wednesday designed to give updates on a delivery driver’s location for years after they have dropped off customers’ packages. “For an extra $5.99, we’re now offering all UPS customers the ability to track their delivery driver from the time he picks up your package at the shipping center to the moment he brings it to your door, and then everywhere he goes for years afterward,” said UPS CEO David Abney in a press conference, during which he demonstrated how each driver will be fitted with a GPS/RFID tracking device, providing customers with real-time email or text message updates on his precise location for months following receipt of their parcel. “It’s important to us to ensure that all our customers know exactly when their package has arrived, where the delivery man goes afterward, and what time he later arrives home from work. And subsequently, of course, whether or not he moves to a new town, stays with UPS or pursues a new career, jogs or bicycles on a regular route and schedule, divorces his wife once his kids have grown, retires, or, ultimately, dies. Our extended-tracking numbers mean you no longer have to plan your life around wondering where your delivery man is.” Abney added that the feature will also help simplify the return process, as customers will now have the option to return any package at any time over the ensuing decade just by going to the delivery driver’s current location and handing it to him.